Sensei Lewis began combative training in 1955 in amateur boxing under the guidance of Mr. Lester (Lett) Philbin and his father, Charlie Lee Lewis. He competed in amateur wrestling from 1959. He began formal martial arts training in the arts and science of Aikido, under the supervision of (Sensei) Mr. Roy Y. Suenaka (5th Dan) at Naha, Okinawa, Japan in 1971. Award 1st Dan Certificate by Suenaka Sensei in March of 1974 and subsequently by Master Koichi Tohei (10th Dan) in October 1974, Subsequent promotions by Suenaka Sensei followed to 2nd, 3rd and 4th Dan respectively in 1977, 1980 and 1987. Promoted to 5th Dan (5th Degree Black Belt) by Shihan (6th Dan) Rick Sosa in September 2002 and to 6th Dan in May 2005. 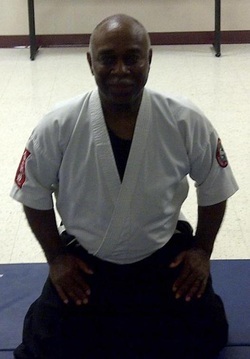 On October 9, 2011 promoted to the rank of 7th Dan (7th Degree Black Belt) by Doshu Rick Sosa. Study and practice of Aikido have been continuous since 1971. Instruction was taken under various teachers and practitioners of the art including Mr. Ricardo Sosa of Dallas, Texas; Mr. Ronald Granville of Moreno Valley, California; Mr. Brian Dossett of London, England; Mr. Pat Strattford of Coventry, England; Mr. Roy Suenaka of Charleston, South Carolina; Mr. Walter Todd of California and Mr. Dan Sharp of Ypsilanti, Michigan. Other martial arts training includes basics of Korean Tae-Kwon-Do under supervision of Mr. Yong Lae Park of Taegu, Korea (1975-76); Korean Hap-Ki-Do under supervision of Mr. Song Hun Pak (awarded 1st Dan in 1981); and basics of Filipino Arnis under supervision of Mr. Emanuel de Leon, of Lorraine, Ohio and Mr. Ricardo Sosa of Dallas, Texas. Teaching experiences include conducting youth, adult and special women’s self-defense classes at various locations. These include Kinchloe Air Force Base, Michigan, Taegu Air Base, Korea; March Air Force Base, California; Royal Air Force Station Wethersfield and Witham, Essex United Kingdom; Plattsburgh Air Force Base, New York; Eastern Michigan University and Superior Township, Ypsilanti, Michigan; Terre Haute and Rockville, Indiana. Competed as a collegiate wrestler at Ypsilanti High School, Michigan and continued wrestling pursuit after entering the United States Air Force. He won the 1970 Tactical Air Command Championship title in both Olympic Free Style and Greco-Roman Wrestling. He won the Far East Inter-Service Wrestling Championship titles in 1971, 1972 and 1973. He has assisted as volunteer coach for YMCA and other youth programs. Additional Training: He received certification as Security Skills Instructor through the Indiana Department of Corrections, Correctional Training Institute. He received certification for Situation Control (Hostage Negotiations Team) and Personal Protection Instructor through, Indiana Department of Corrections, Emergency Response Operations, 2003. Sensei Lewis has also taught law enforcement and corrections staff.